Hello to all. I’m sure everyone has enjoyed the last few days of cold temperatures. Not! I know I was not ready for it, especially after all the hot and dry weather we have had for so long. Brought my long handles out and have worn them all week. Becky and I spent a few days in Branson, Missouri the first of the week and really enjoyed the time together. Took in some beautiful scenery and a wonderful concert by the group SIX. The group consists of six brothers and all of their music was performed without the use of instruments. They were fantastic. We have also spent the weekend watching local performances of “A Christmas Story” and “The Best Christmas Pageant”. One on Friday night and the other tonight. We just happen to be related to the star of both plays and are very proud of them. Tonight I have included an article about another one of the well-known Christmas carols that we all have heard for many years. “Joy to the World” is sung all over the world in many different languages. I just heard it a few minutes ago on television and also heard it on the radio on the way home tonight. I hope you enjoy the following story of how Isaac Watts included this hymn in his collection of “The Psalms of David”. “Joy to the world” is perhaps an unlikely popular Christmas hymn. First of all, it is based on a psalm, and, second, it celebrates Christ’s second coming much more than the first. This favorite Christmas hymn is the result of a collaboration of at least three people and draws its initial inspiration not from the Christmas narrative in Luke 2, but from Psalm 98. 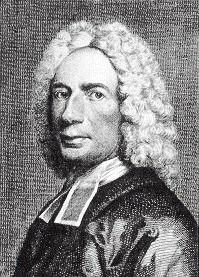 The first collaborator was the English poet and dissenting clergyman, Isaac Watts (1674-1748). He paraphrased the entire Psalm 98 in two parts, and it first appeared in his famous collection, The Psalms of David, Imitated in the Language of the New Testament (1719). “Joy to the world” was taken from the second part of the paraphrase (Psalm 98:4-9), entitled “The Messiah’s Coming and Kingdom.” Watts, commenting on his paraphrase of the psalm, notes: “In these two hymns I have formed out of the 98th Psalm I have fully exprest what I esteem to be the first and chief Sense of the Holy Scriptures . . ..” For Watts, the psalms were not to be viewed as biblical material in their own right, but had value only inasmuch as they pointed toward the New Testament. The “curse” is a reference to Genesis 3:17 when God says to Adam following the eating of the apple from the tree, “Thou shalt not eat of it: cursed is the ground for thy sake; in sorrow shalt thou eat of it all the days of thy life.” (KJV) As a part of “five-point Calvinism,” the “total depravity of man”, the curse is a significant part of classic Reformed theology, Isaac Watts’ theological perspective. he makes his blessings flow. The second collaborator was an unwitting one, George Frederic Handel (1685-1759), the popular German-born composer residing in London. Though contemporaries in England, they did not collaborate on this hymn. Another pieced together portions of Handel’s Messiah to make up the tune that we sing in North America. The opening bars for the chorus, “Lift up your heads,” was adapted to the incipit “Joy to the world.” An instrumental portion of the opening tenor recitative, “Comfort ye,” provides a basis for the text “heaven and nature sing.” Such borrowings were common, the aesthetic notion being that the music of great musicians had in itself an innate beauty. Even a crude pastiche of “great music” implied that the result would also be of high quality. The third collaborator who assured that this tune and text would appear together in the United States was the Boston music educator, Lowell Mason (1792-1872). It was Mason, a musician with significant influence in his day, who published his own arrangement of Handel’s melodic fragments in Occasional Psalms and Hymn Tunes (1836) and named the tune Antioch. While this is not the only tune to which Watts’s text is sung, it is certainly the dominant one. Actually, this tune remains virtually unknown in Great Britain. When sung to Antioch, the text is repeated in the second section, reflecting a particular early American treatment of the melody called a “fuging tune.” A fuging tune was a compositional device initiated by American-born composer William Billings (1746-1800) where voice parts enter one after the other in rapid succession, usually repeating the same words. The result of the fuging tune section is quite effective for the first stanza—“heaven and nature sing”—and the second stanza—“repeat the sounding joy”—and the fourth stanza, “wonders of his love” For the third stanza, with the text “far as the curse is found” echoing of Genesis 3:17-18 and Romans 5:20, the fuging compositional device seems a bit rollicking. The result is a favorite Christmas hymn based on an Old Testament psalm, set to musical fragments composed in England, and pieced together across the Atlantic in the United States! I love Christmas carols and have developed a much greater appreciation for the writers, the words and the music that is presented by them. As I’ve said before, it never ceases to amaze me how God uses all kinds of people at various points in time to bless us with their talents. Good evening to all. I hope everyone had a good week and are happy to finally see some rain coming our way. It sure was a long dry spell but it looks like that has ended. Maybe we will also see some snow later on. I know all the kids would enjoy that. It’s hard to believe that Christmas Day is only three weeks away. Where does the time go? Speaking of Christmas I have included an article about the history of another carol. Many of our Christmas carols were written around the theme of peace on earth and “Hark The Herald Angels Sing” is no exception. I hope you enjoy the following article about that wonderful old song. The opening lines of this favorite Christmas hymn echo Luke 2:14, “Glory to God in the highest, and on earth peace. . .” (KJV). Immediately, the hymn writer established a cosmic connection between the heavenly chorus and our hope for peace on earth. While many Christmas carols recount in one way or another the Christmas narrative, Wesley provides a dense theological interpretation of the Incarnation. Wesley begins not with the prophets, the Annunciation to Mary, the journey to Bethlehem or the search for a room, but in media res – in the middle of the action. Rather than citing the final phrase of Luke 2:14 – “good will toward men” (KJV) – he offers his theological interpretation – “God and sinners reconciled.” This is indeed a stronger theological statement. Note that lines 2, 3, and 4 of the opening stanza are placed in quotation marks, an indication that they are virtually citations from Scripture. Wesley includes his theological interpretation of the last poetic line within the quoted material indicating the strength and authority of his perspective. “God and sinners reconciled” was a natural interpretation since the hymn was written within a year of Charles Wesley’s conversion. 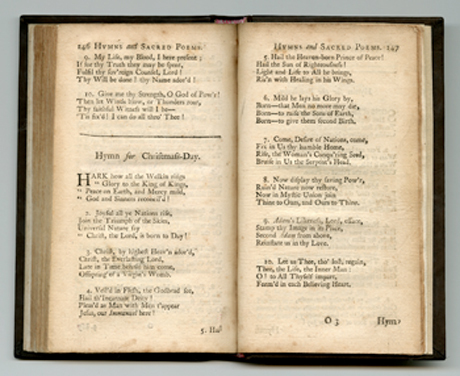 It first was published under the title “Hymn for Christmas Day” in Hymns and Sacred Poems (1739) in ten shorter stanzas, each stanza half the length of the stanzas we sing today. The hymn that we now sing is the result of many alterations by numerous individuals and hymnal editorial committees. Changes in hymn texts are quite common. The average singer on Sunday morning would be amazed (or perhaps chagrined) to realize how few hymns before the twentieth century in our hymnals appear exactly in their original form. Perhaps the most notable change in this hymn was Wesley’s first line. The original read, “Hark how all the welkin rings!” “Welkin” is an archaic English term referring to the sky or the firmament of the heavens, even the highest celestial sphere of the angels. This term certainly supported the common eighteenth-century notion of the three-tiered universe, where the top tier includes the celestial beings, the lowest tier the normal activities of humanity (birth, death, marriage, work, sickness) and the natural created order (rain, drought, natural disasters), and the middle tier where celestial beings influence the activities of beings and events on earth with their superhuman powers. The familiar first line we now sing sets up the opening stanza as an expansion of the song of the angels in Luke 2:14. Rather than exerting influence in the form of spirits, demons, or other beings said to inhabit the middle zone of the three-tiered universe, God, through the Incarnation, comes directly to earth in human form, the “Word made flesh . . . [dwelling] among us . . . full of grace and truth” (John 1:14, KJV). The change in the opening line is perhaps the most significant alteration of the many that have taken place in this hymn over the centuries. The second most significant change from the original is the addition of the refrain, reiterating the first phrase of Luke 2:14. This came about for musical reasons. Almost exactly 100 years after the hymn’s composition, Felix Mendelssohn (1809-1847) composed a cantata, Festgesang (1840), celebrating the 400th anniversary of the invention of moveable type by Johannes Gutenberg. A chorus from this cantata was adapted and paired with Wesley’s text in The Congregational Psalmist (1858) by an English musician and singer under Mendelssohn, William H. Cummings (1831-1915). A famous and influential hymn collection, Hymns Ancient and Modern (1861), carried this arrangement and helped to standardize its form and promote its broader use. Pairing the tune MENDELSSOHN with Wesley’s text caused two additional changes from the original. 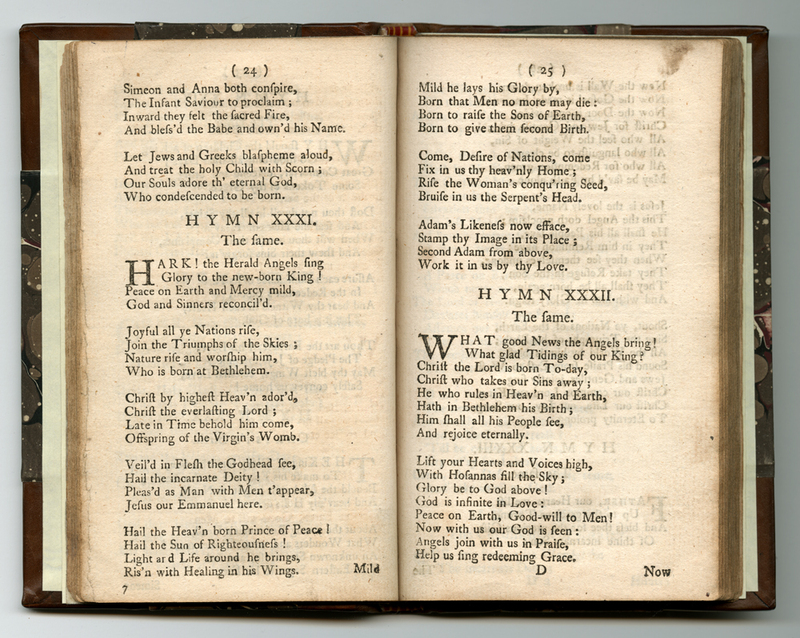 Two of Wesley’s short stanzas were combined into one to fit the longer tune; a refrain, repeating the first two lines of stanza one, was added to accommodate the tune. There is no doubt that most of the alterations to Wesley’s original text combined with Mendelssohn’s rousing tune have helped to make this one of the most festive and popular of all Christmas hymns. Wesley often used the words, “mystic union,” a Moravian concept that he incorporated into Wesleyan theology in the second stanza cited above. In the third stanza above, we are reminded of imago Dei in the phrase, “Stamp Thine image in its place,” taking on the image of God in place of that of sinful Adam, a reference to the Wesleyan concept of sanctification. “Hark! the herald angels sing” highlights the virgin birth, the universal application of the coming of “th’incarnate Deity” to all nations, and that Christ, who was “pleased with us in flesh to dwell,” gives humanity a “second birth.” The “second” or “new birth” was essential to Wesleyan theology in light of a controversy with the Moravians. The importance of this was illustrated in John Wesley’s sermon, “The Marks of the New Birth” that provides extensive scriptural basis for his view. The final stanza in most hymnals paraphrases the beautiful biblical citation from Malachi 4:2: “But unto you that fear my name shall the Sun of righteousness arise with healing in his wings” (KJV). Becky and I will be traveling tomorrow so we request that you pray for us that God will give His travelling mercies on us. We will be spending a few days in Branson, Missouri and will be back in town on Wednesday evening. Love you all and God Bless each of you.